The big bus was not quite full but it was brimming with 'friendship through gardens' and enthusiasm for what turned out to be a terrific outing to the Jacaranda Festival in Grafton. 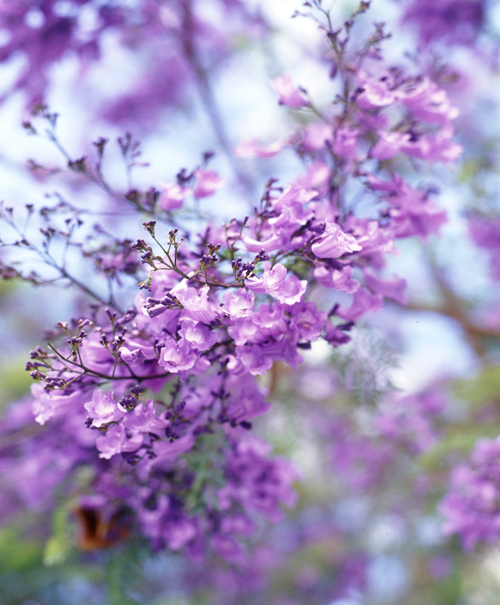 The 81st Grafton Jacaranda Festival, running from 30 October to 8 November 2015 is HUGE. There is just so much happening in this town of less than 20,000 people it is a real credit to the organisers of this event. There are 17 official events and 22 Affiliate Events over the nine days of the Festival. There is literally something for everyone during the Festival, far too many to list. For a full run down click here. Mr H.A. Volkers must have had a true love of Jacarandas (or excess seed supply as he was a seed merchant) when he was contracted to plant street trees for the Grafton Council in July 1879. Mr Volkers was totally instrumental in the supplying and planting of hundreds of Jacaranda trees during the 1880's along the streets of Grafton, the first 60 street trees were planted in Pound Street between Mary and Villiers Streets. In 1858, sixty-nine inhabitants petitioned for a municipality which was granted and gazetted on 20 Jul 1859 and later Grafton was proclaimed a city in 1885. It would have to be said that the municipal representatives were indeed very progressive in making their new city look very special with the extensive street plantings. Jacaranda (sp Jacaranda Mimosifolia) may live up to 200 years and originates from South America, predominately from Brazil. Jacarandas may reach a height of around 10-15m, with a spread of around the same. They are deciduous, not because of cold winters, but rather because of the monsoonal wet and dry seasons. They briefly drop their leaves at the end of the dry season (winter), flower, and then leaf up again when the summer rains come. They are best not pruned as they send up vertical regrowth shoots which are not at all that attractive, sometimes this can been seen in street trees which have been pruned to make room for overhead powerlines. These gorgeous trees make the most stunning feature tree but be warned, do not plant near a swimming pool! You will be forever scooping up the mess from this tree - be it leaves, blossum or seed pods! As we were travelling by bus we really did have a bird's eye overall view of the city of Grafton atop the challenging bridge (with the two corners in it). The attention to detail of this Festival was wonderful - each Open Garden was easily identified with the jacaranda blue Bali flag and prominent signage. The Open Gardens were not all about just jacarandas, they were totally about beautiful places that people created to express their love of gardening. How about this gardener's use of popping colour? This garden was perfectly presented with extensive plantings of annuals among an interesting mix of permanent plants. We visited the golf club where the gardens are maintained by volunteers with incredible art works displayed throughout crafted by a member of the club; a tourist village with a beautiful ambiance; three private gardens - all different and wonderful to visit; and the Memorial Park a fitting commemorative park which has mature shade trees and manicured gardens and hedges with the stunning backdrop of the Clarence River. The view above was from our lunch destination at the South Grafton Women's Bowling Club where the ladies put on a traditional 'country spread' for us which was just lovely. A trip to Grafton would just not be complete unless there was a stop at Benefields Rose Nursery to have that last little retail opportunity! Thank you to the Program Committee for organising such a brilliant outing for members (we even welcomed some new members at this outing, what a beaut introduction to CHGC) and we look forward to many more interesting destinations in 2016.